A young and very inexperienced Stornoway side went down 36-5 against an Aberdeen Wanderers outfit who were, if truth be told, rather uninspiring, but had enough in their ranks to be able to get the job done. Even though the game was held at Stornoway’s home pitch at Bayhead, it was clear they were up against it from the start, with a drastically weakened pack without the talents of the likes of Angus “Og” MacArthur and Roddy Graham, to name but two. The front row was made up of Sean Smith, Ross Morrison and Innes MacLean and while they each have plenty of potential and youth, they were no match for a much bigger and more experienced eight. Scrum ball for Stornoway was virtually non-existent. Andy MacLeod - himself a relative newcomer - battled hard in the back row and big Rick MacLeod was his usual workhorse self, but there was precious little possession with which to work. After 35 minutes, despite Wanderers being in the ascendancy, it was still just 9-0 with three penalties, but on the half-time whistle the visitors scored a breakaway try to give themselves a 15-0 lead. At the start of the second half Stornoway lost two tries in quick succession and the game was effectively over as a contest. It was important at this point for the young Stornoway players not to let their heads drop and this they managed, going on to actually dominate some of the play. Rick MacLeod was unlucky not to have been awarded with a try in the first half when the referee adjudged him to have made a double-movement in the act of touching down, but the home side were to cross the line before the end - and it was no more than they deserved. Good work down the right by the forwards saw the ball being shipped to David MacKay and he produced a delicate chip over the defence. Iain ‘Fish’ MacKinnon won the race to the ball and touched down for a well-deserved consolation. While Stornoway at home would normally be a match for Wanderers, this is a side in transition with precious little game-time experience. 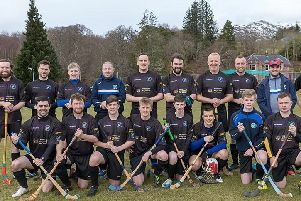 This Saturday they face the most daunting prospect of all when they hit the road for an away tie against runaway league leaders Aberdeenshire who have averaged over 50 points a game so far.